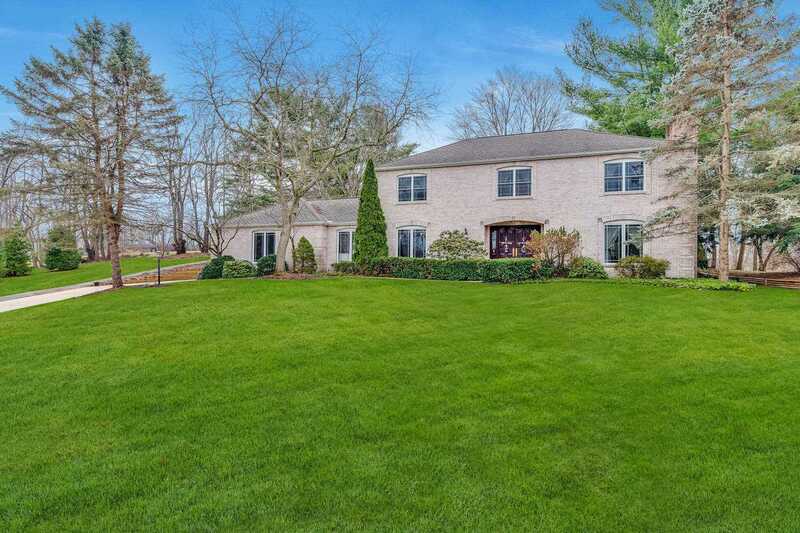 Enjoy many private views of Knollwood Golf Course's 15th Hole curled up inside this two-story brick home. This convenient central location is less than 15 minutes from Notre Dame, South Bend, and the University Park Mall shopping district as well as just over 1 mile to the The Knollwood Country Club. Entering the main level, you'll be ready for entertainment with the foyer's 3 closets, half bath, and its easy access into the spacious dining room, living room, and family room all with hardwood flooring. You'll stay cozy inside here with its 3 gas log fireplaces found in the living room, master suite, and a shared fireplace between the family room and office. In the family room, guests can enjoy a closeted bar complete with a sink and built in cabinets and shelves before an easy walk out to the semi-covered, back patio behind the Green. The office also includes built-in floor to ceiling shelves and a bay window golf course view. The eat-in kitchen area includes a custom, arched cooking area with a brand-new stainless-steel double oven and a new stove top. Upstairs features 4 large bedrooms including a central full bath, and a master suite with a full bath, walk-in closet, vaulted ceiling with skylights. Additionally, in this home you can find a partially finished basement, oversized 2 car garage .. plenty of room for golf cart and lawn equipment, invisible electric dog fence with collar, included portable generator , two furnaces & AC&apos;s, and a huge main level laundry/mudroom. Recent updates include Marvin Windows throughout the majority of the home (2013), one furnace/A/C (2016), Water Heater (2014) and kitchen appliances (3 years or less). This very efficient home has average utilities of $116 for gas and $113 for electric. Call now to see this beautiful home today!